Réjouissance was founded in 1995 by Symphony Nova Scotia musicians Karen Langille and Ivor Rothwell. 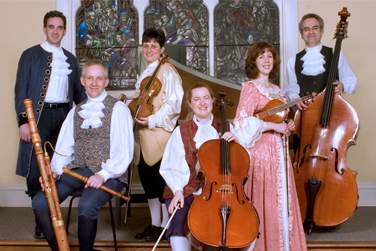 This ensemble specializes in the performance of 17th and 18th century music on both period and modern instruments, in historically informed style. Réjouissance draws most of its repertoire from the vast collections of European instrumental music — from early 17th century Italian composers to great 18th century German masters like Bach, Handel, and Telemann. Musical offerings include trio sonatas, solo sonatas, early instrumental dances and early song settings… occasionally enhanced with the addition of a crumhorn! Réjouissance has been heard on CBC Radio 2, both locally and nationally, and has appeared in many historical venues throughout Nova Scotia. In addition to offering their own concert series at Bethany United Church in Halifax, Réjouissance has appeared in most concert series in the area. Réjouissance has also had the privilege of performing at a number of important cultural events in Nova Scotia.